Because of all the walking involved, sledders and tobogganers can get quite a workout. As another holiday season comes to a close, many Utahns will not only reflect on the memories made, but also the weight they may need to lose. A survey published in the New England Journal of Medicine shows Americans gain about a pound over the holidays. So if you feel guilty about all those sweets you indulged in the past few months, your New Year’s resolution may be to get back in shape. 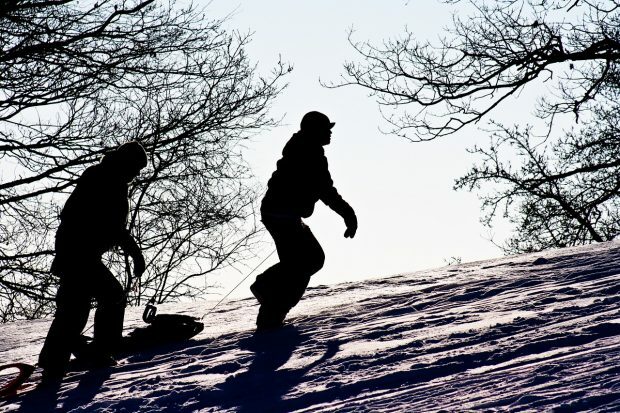 Here are five fun ways to stay active this winter. Salt Lake Community College students need to take at least one Health and Lifetime Activities class while studying here. A wide range of HLAC classes are available to keep you active this winter, including yoga, basketball, volleyball, skiing/snowboarding, ice skating and bowling. People from all over the country and around the world come to Utah to ski and snowboard. Join them! If you’ve never taken a trip down the slopes, make this the year you learn. Salt Lake County Parks and Recreation has a promotion called Thursday Night Lights. It allows skiers and snowboarders of all abilities, beginner or expert, age 10 or older to ski for a discounted rate from 4 to 9 p.m. on select Thursdays at Brighton Resort. Buy a lift ticket or add lessons and rentals with prices starting at just $28. When there’s enough snow on the ground, grab a sled and find a hill. Depending on the size of the hill, you can get a serious workout on the inclined walk back up. Riverbend Golf Course in Riverton has a large hill that is their driving range when it is not covered in snow. When covered in snow, it makes for a fun day of sledding and many calories burned. Your wallet will be happy, too. If all else fails, building a snowman is another cheap and fun way to actively appreciate the winter weather. If you are looking to get off of the couch but stay out of the cold, the mall is a great place to walk around. Many of Utah’s malls open their doors before the shops open allowing the public to walk freely through their concourse without the crowds. From the stunning design of City Creek Center to the centrally located Fashion Place and the recently renovated Shops at South Town, these malls make ideal indoor spaces to remain active during the winter months. Twice a year Salt Lake County Parks and Recreation puts on the Salt Lake County Corporate Games. The “Olympic” style competition is a fun way to build company morale and stay active. The Corporate Games provide opportunity for everyone to contribute, from co-ed 3-on-3 basketball and table tennis to the Wellness Walk and volleyball. The competition can involve anywhere from 30 to 75 companies, ranging from small to large businesses. Kent explains that nearly all of the events are in the evenings since most participants work during the day. “We don’t start any earlier than six o’clock usually on weeknights. Certain events in the summer [like] golf will be during the day,” she says. The registration deadline for the 2018 Winter Corporate Games is Jan. 2.